Halong Bay, whose name means "descending dragon", is a stunning site, where 3,000 limestone karst islands and peaks rise out of the emerald green waters of the bay. The best way to appreciate this area is on a slow junk boat ride through the bay, stopping off to explore limestone caves filled with stalactites and stalagmites, encounter floating fishing villages, enjoy secluded beaches or just swimming in the bay itself. 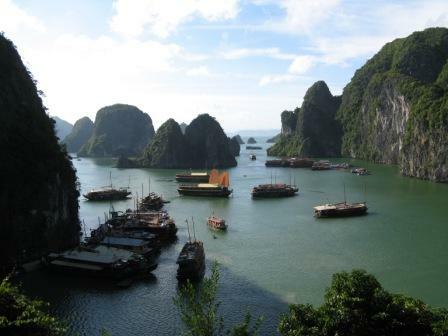 Organised group tours: Click here to see 21 tours to Vietnam which may include Halong Bay.